Streamline your payment process and give guests more options by accepting electronic checking account debits to your vacation rental, all the while eliminating the need for paper checks. 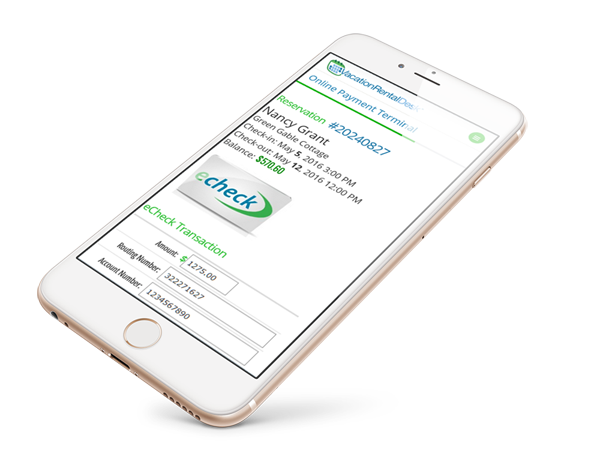 Online checks deposit faster than paper checks and improve the cash flow of your business. See online checks in your account in as little as two business days. Pay only $2 per electronic check transaction, a low fee you can easily pass along to guests during checkout. Guests receive automated receipts to their email once they send a payment. Electronic checks now come bundled with credit card processing to make payments for your rental easier than ever. Sign up for credit card processing today and give your guests more choice when it comes to paying for their next vacation.